We regret to announce that we are no longer working with the NSM. We hold no hard feelings towards the NSM overall, but believe that their recruiting method is extremely flawed and unsafe. We would rather work amongst ourselves and recruit new individuals based on trust rather than simply to inflate our ranks. We will remain the hated and proud skins unless we find another group that we feel we fit in better with. Stay tuned for event updates! 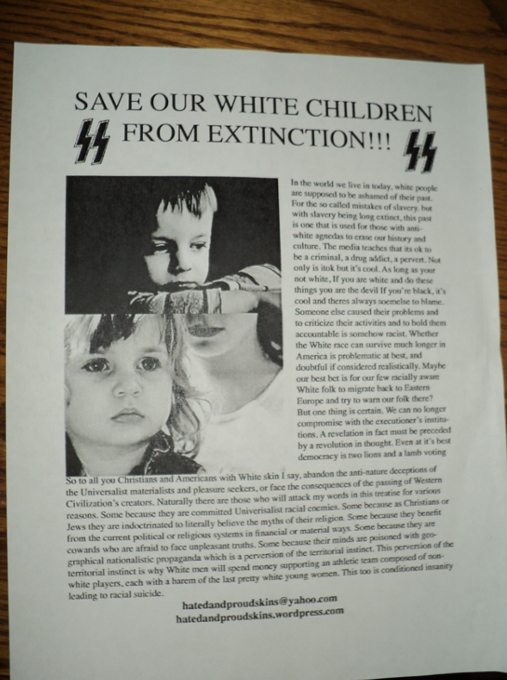 “Save Our White Children From Extinction” flier campaign. 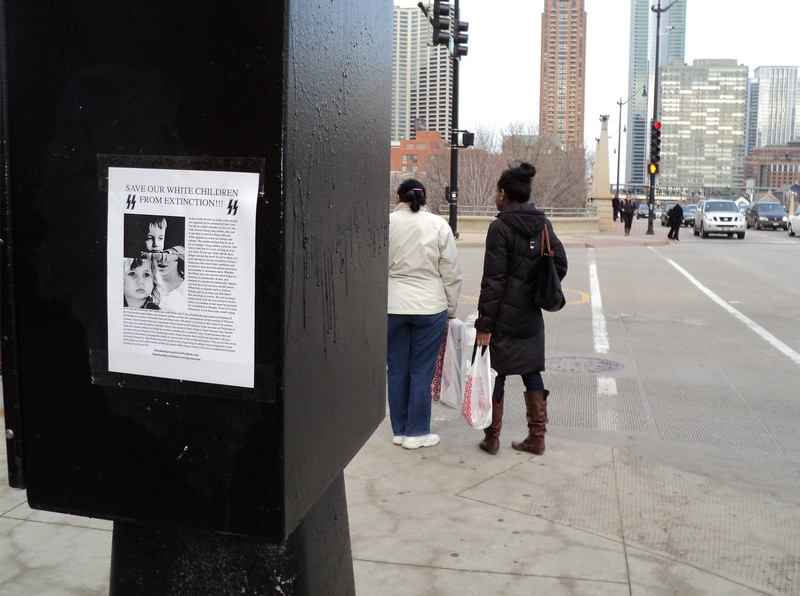 Earlier this week we at Chicago NSM posted up 300 pro-white fliers across downtown and in Summit, IL. The fliers were against white genocide and urged other white brothers and sisters to be proud of our race and to not race mix before it is too late. 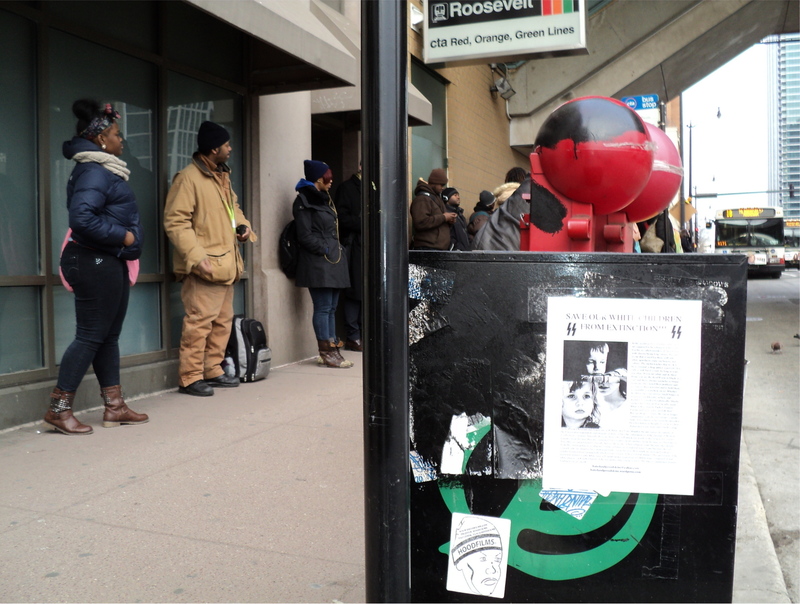 We got a lot of attention and even had a few good conversations with other white folk passing by. The areas we fliered may seem unsafe for some, but we realize the importance of reaching out to areas that need it most. There are many other potential like minded white brothers and sisters out there that are alone. We are determined to make a statement in Obamas hell hole of diversity and crime. 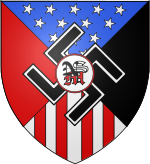 The hated and proud skins have officially become the Chicago Unit of the National Socialist Movement. We recently decided our mission is the same and that it makes sense to join up with a group that is already doing great work and have already made a name for themselves. We are proud to be NSM and we are determined to build the unit in our area. We will be attending nationals this year and will have a lot of work to do in the coming years. We are here to stay. As 3 friends who grew up in summit, IL we had our fair share of clashes with non-whites. We witnessed many times in school, how assaults against us were always justified by “racism”. Specifically, blacks always got the pass while on the other hand, anytime we were willing to take a stand, it was racism and we were dealt with in a far more serious manner. In our slightly mature age, and after playing racially conscious punk and oi music together for years, while having no scene to support our “outsider” views, we decided it was time to start something that was serious, and had more to offer than lyrics. As of October of 2012, myself (Ryan), Peter, and Cody decided to form the hated and proud skins. 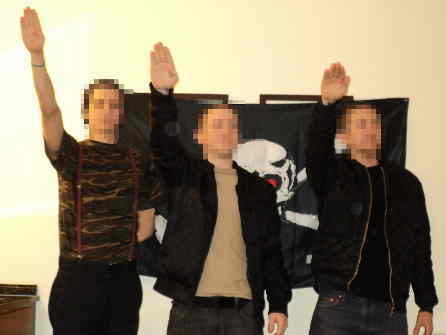 There was several ideas on the table of where to start, and we agreed that come January 1st of 2013 we would have our first official meeting and build what we hope will become a dominant force in the Illinois white nationalist and skinhead movement. At our first meeting we agreed that we would NOT fall into the category of a drinking crew with no ambition. So we decided, that as a start to our organization we want to create original literature for neighborhood distribution and start doing anti-antifa style intelligence (anyone with anything to help get us started with this please email us at hatedandproudskins@yahoo.com). We agreed to meet officially twice a month, and as of right now, being only 3 individuals who are great friends, we will realistically be meeting a few times a week. At the end of our meeting we wrote up our qualifications for joining and how we would go about recruiting. We wish to impress and inspire our members. Because of this, we do NOT want to recruit until we have something to show for our organization; Physical literature for distribution, quality merchandise, and good research. In the meantime, we are very much in need of supporters. Supporters will EVENTUALLY receive literature to distribute, merchandise, email updates and will have a far easier time becoming a member when and if they choose to. Until we get our merchandise and literature together, we have original SS marching songs professionally pressed on cassette to supporters to show our appreciation to their support. Send us an email to hatedandproudskins@yahoo.com with the subject line reading “supporter application”. In the message content you MUST provide us with an email address, phone number, and a reason for your interest. Any additional details are appreciated but are NOT mandatory. After dialogue and trust is built we will ask for a mailing address in order to supply you with supporter material. Although we are a skinhead crew, supporters can be of any background or define in anyway so long as you are white and proud. The Hated and Proud Skins are ready to fight. We hope you will join us. Private Ryan, Peter, and Cody.